Crustaceans are the largest group of marine arthropods. 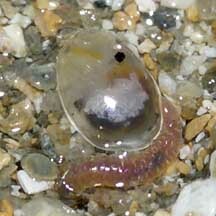 Surprising crustaceans include barnacles, sea slaters. Crustaceans belong to Phylum Arthropoda which includes insects, spiders, centipedes. Crustaceans are among our favourite seafood! Having to personally dismantle some of these creatures to eat them, many of us are more familiar with them than we might imagine. What are crustaceans? If crustaceans remind you of insects, they are indeed related and belong to the same Subphylum. Together with more familiar creatures like spiders and centipedes, they all belong to the Phylum Arthropoda. Crustaceans are the largest group of marine arthropods. There are about 45,000 known species of crustaceans. More than 80% of these are marine. Arthropods have a hardened outer skeleton (exoskeleton) called the cuticle. They have jointed legs. Arthropods make up nine-tenths of all known animals, so this body plan seems to work well. Crustaceans come in a wide range of body forms. Some adults are so unlike 'typical' crustaceans that it is hard to believe they are related to familiar creatures like shrimps and crabs. These include barnacles, often mistaken for oysters or limpets, and parasitic barnacles that invisible for most of their lifecycle! 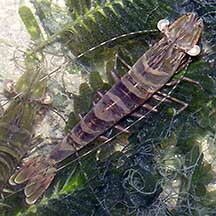 Sea slaters scurry about by the hundreds over rocks at low tide and are often mistaken for insects or cockroaches. They are, however, crustaceans just like crabs and prawns. One crustacean characteristic that distinguish them from other arthropods is that at some time in their life cycle, crustaceans have two pairs of antennae. All other arthropod groups only have one pair. Most crustaceans have limbs that are branched (biramous), while other arthropods don't. Classifying Crustacea: Nearly 60% of crustaceans fall into the Class Malacostraca. Most malacostracans (10,000 species) belong to the Order Decapoda. Crusty cast-off: Like other Arthropods, crustaceans have to shed their hard outer skeleton (exoskeleton) in order to grow bigger. The process is called moulting and is quite fascinating. More about moulting. Human uses: Crustaceans are eaten by people everywhere. 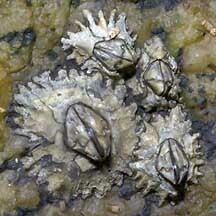 Barnacles grow on any surface in the sea, including ships, water pipes and other important infrastructure. Thus these tiny animals can affect human activities in a big way. Status and threats: Sadly, many of our beautiful and fascinating crustaceans are listed among the endangered animals of Singapore. Like other marine creatures, they are vulnerable to habitat loss due to reclamation or human activities along the coast that pollute the water. They are also vulnerable to trampling by careless visitors and over-collection for food and for their shells can affect local populations. 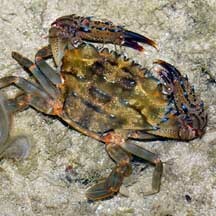 Crabs are among the more familar crustaceans. 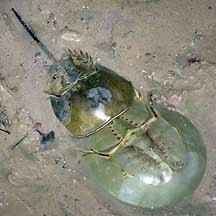 Horseshoe crabs are NOT crustaceans! From Davison, G.W. H. and P. K. L. Ng and Ho Hua Chew, 2008. The Singapore Red Data Book: Threatened plants and animals of Singapore. Tan, Leo W. H. & Ng, Peter K. L., 1988. A Guide to Seashore Life. The Singapore Science Centre, Singapore. 160 pp. Ng, Peter K. L. & N. Sivasothi, 1999. A Guide to the Mangroves of Singapore II (Animal Diversity). Singapore Science Centre. 168 pp. Crustaceans and Malacostracans on the Life on Australian Seashores by Keith Davey on the Marine Education Society of Australia website: Fact sheets with photos, diagrams, and even animated gifs with details on various species found in Australia. How do crustaceans get their colour? Jones Diana S. and Gary J. Morgan, 2002. A Field Guide to Crustaceans of Australian Waters. Reed New Holland. 224 pp. Wee Y.C. and Peter K. L. Ng. 1994. A First Look at Biodiversity in Singapore. National Council on the Environment. 163pp. Davison, G.W. H. and P. K. L. Ng and Ho Hua Chew, 2008. The Singapore Red Data Book: Threatened plants and animals of Singapore. Nature Society (Singapore). 285 pp. Debelius, Helmut, 2001. Crustacea Guide of the World: Atlantic Ocean, Indian Ocean, Pacific Ocean IKAN-Unterwasserachiv, Frankfurt. 321 pp. Gosliner, Terrence M., David W. Behrens and Gary C. Williams. 1996. Coral Reef Animals of the Indo-Pacific: Animal life from Africa to Hawaii exclusive of the vertebrates Sea Challengers. 314pp. Make your own badge here. Spot errors? Have a question? Want to share your sightings? email Ria I'll be glad to hear from you!